Jenn at Stories from the Saddle asks: I want to know: Why do you do what you do? […] I want to know why you have chosen the particular discipline you have. This would be a whole lot easier if I had actually chosen a discipline. The honest answer is that I’ll do any discipline if somebody would teach me how. I’ve already learned a little reining, some Western mounted games, showjumping, dressage, eventing, some showing and lots of hacking, but there’s still a woeful amount of disciplines I have never even tried: vaulting, polo, racing, cutting, equitation, tentpegging, endurance, polocrosse, horseball, driving, saddle seat, etc. My reasons for not choosing a discipline are simple: I don’t want to just compete, I want to be a horsewoman, and to me that means understanding the horse on every possible level, and striving for the perfect horse-human relationship; where both horse and person are happy and living life to their fullest. I believe this happens at its best when the horse is in the discipline best suited for its mind and body. Given the choice (not always possible with a client horse), I apply more or less the same basic schooling ideas to the horses I work with, with the exception of teaching a Western horse to neck-rein early on. In the groundwork and schooling process I look for the horse’s strong points and work towards a discipline that utilises them to their best. An intelligent horse with flowing movement will generally start learning dressage; a courageous, scopey horse will start with jumping or eventing. Of course, knowing the breeding helps to work with a certain goal in mind from day one, but generally I try to go with whatever the horse enjoys most. It’s always a better idea to work with what God has so brilliantly created instead of against it. But if I am to be honest then I must admit that I love eventing for the simple reason that it’s extremely difficult to do well. Oh, all the disciplines are; but eventing is a very good test of the horse, the rider, and their relationship all-round. The event horse has to have good movement, conformation, intelligence, scope, speed, vast amounts of courage, a great work ethic and a willingness to try his best for his rider. 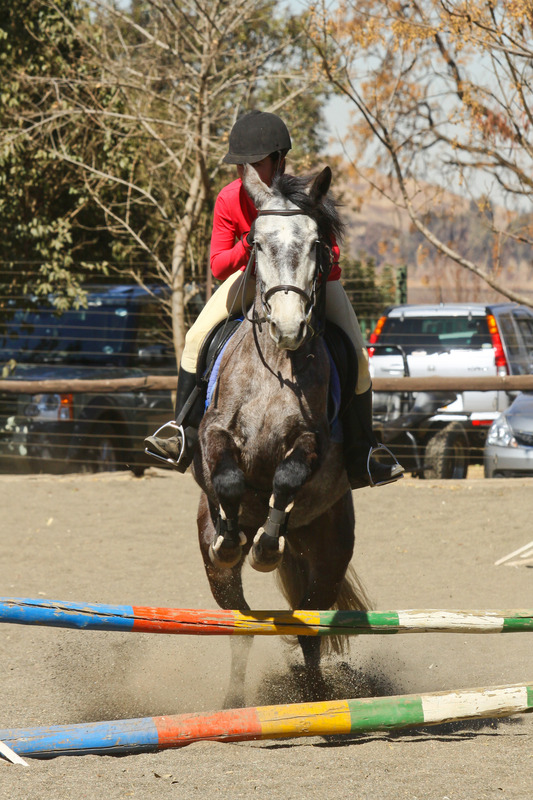 The rider has to be able to sit like a royal personage in the dressage arena, guts it out across country and speed around the showjumping, not to mention having the tact to persuade an extremely lively and fit horse to behave himself. Together, the horse and rider both have to be trained to be precise, brave, fast, and quick-thinking. Added to this, the event horse is superbly fit. Of course, showjumping and dressage in their pure forms are far more specialised. But I believe the event horse cannot afford to have many of the weak spots in his training that the more specialised disciplines have. I know of advanced dressage horses who refuse to go out on a hack, and of higher-level showjumpers who have never been taught to carry themselves in the right way. Plus there is the cross-country! I don’t mean to belittle any of the other disciplines because I love them all. They are all special in their own way; eventing just so happens to appeal to me the most, perhaps because I get bored so quickly, and an eventer has to have a tremendously varied work routine in order to be good at everything he has to be good at. Besides, I defy anyone to ride across country at a challenging height (for them) and not be scared enough to not be bored. A Poor Workman Blames his Tools?